Biologists have discovered that the 2010 Gulf Oil Spill is making a deeper impact on marine life than they had predicted. As NewsHour’s Murrey Jacobson reported last year, the oil spill captured the world’s attention for polluting the waters of the Gulf of Mexico, shutting down area businesses — including fisheries and beaches — and fouling marshes and wetlands. 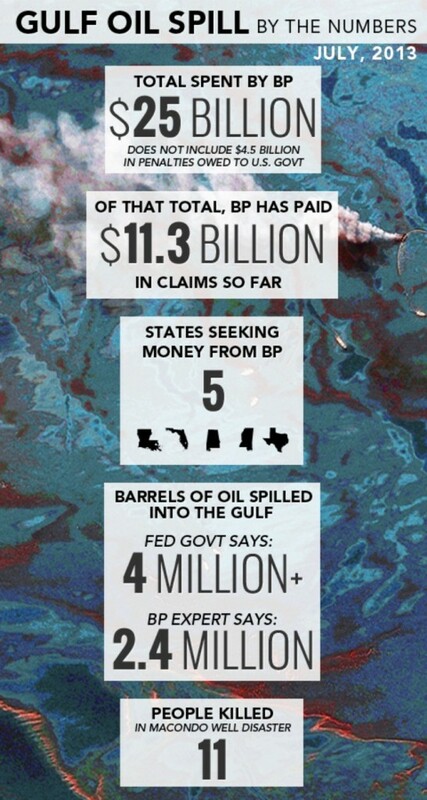 Three companies were involved: oil giant BP; TransOcean, which operated the Deepwater Horizon drilling rig; and Halliburton. Pennsylvania State University researchers recently found two partially dead, deep sea coral reefs 22 kilometers east of the site of the spill, according to a study released this week. Before these findings, biologists only knew of one reef that was damaged by the oil spill. The reef was closer to the surface and only 14 kilometers south west of the site where 210 million gallons of oil gushed into the the Gulf of Mexico over a period 87 days. “The footprint of the impact of the spill on coral communities is both deeper and wider than previous data indicated,” Charles Fisher, who led the study, told ThinkProgress. BP scientists published a response to Monday’s paper, arguing that PSU researchers “prematurely linked” the oil found on the coral reefs to the 2010 oil spill, when it could have come from other sources including underwater landslides or natural oil and gas seeps. PSU researchers defended their study and emphasized that their testing proved that the oil found on the reefs was the same as the oil from the spill. The study includes two theories that could explain how these more distant reefs were damaged by the oil spill. The first theory is that a plume, or cloud of undersea oil droplets, traveled deeper and in a different direction than scientists previously believed. The second possibility is that oil on the surface of the water sunk and landed on the reefs as a substance called “toxic marine snow.” Scientists say toxic marine snow is formed when chemical dispersants, used to prevent oil spills from reaching coastal environments, cause the oil to form droplets that fall hundreds of feet below the surface. Deep sea reefs are crucial for underwater ecosystems. In addition to providing habitats for dozens of species, the reefs also participate in carbon and nitrogen cycling processes and shelter the eggs of fish and sharks. Fisher said the discovery of additional damaged reefs indicates that the deep sea is still responding to the 2010 spill’s damage. “It seems like its been along time [since the spill], but the deep sea is a slow-moving environment. The water temperature down there is 4 degrees Celsius… Things change slowly. So it could be a while before things are fully recognized in the wider Gulf,” he said. 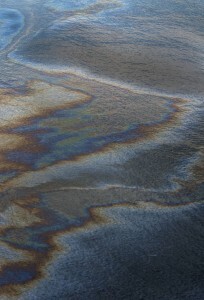 Left: A sheen of oil floats on the surface of the Gulf of Mexico near Gulf Shores, Alabama in 2010. According to a study published this week, BP's 2010 oil spill is affecting more marine ecosystems than biologists previously believed. Credit: Kari Goodnough/Bloomberg via Getty Images.